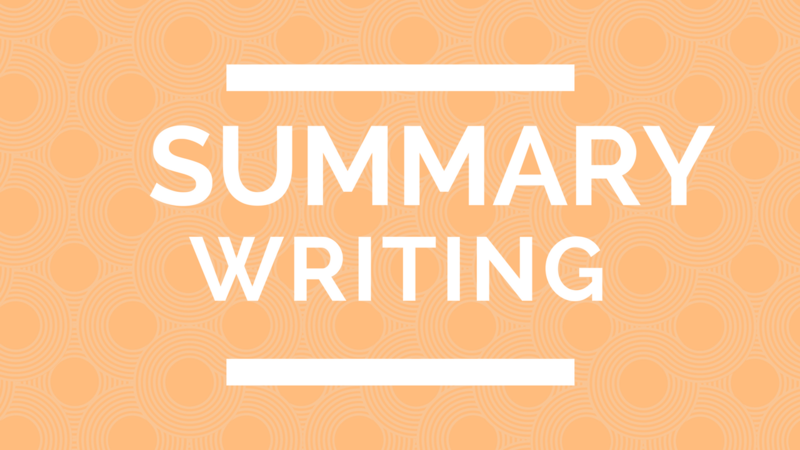 This post is the last post we have for narrative writing in this CSEME 2018 Exam Countdown. I have also link all the Narrative Writing posts below. Summarize the passage below in no more than 50 words. There is a fourth dimension to any garden that may often be overlooked. This is the dimension of fragrance, and although its appreciation is not new, it seems to have been cast aside to make room for texture, form and color. Fragrance is subjective, and opinions of it diverse, but it is unquestionable that the garden planted with scented flowers offers the added bonus of fragrance in addition to form and color. It has been said that smell is the sense that is most memorable and that none of the other senses is more subtle in its suggestions or more reminiscent of a certain time. The purpose of a flower’s fragrance is thought to be that of an attractant to nectar-feeding insects. Not all perfumes are found in the flowers, however. Scents may also be found in roots, bark, gum or oils, leaves, stalks and sometimes in the seeds. Generally, fragrant flowers are lightly colored or white. Although brilliantly colored flowers are not usually fragrant, there are exceptions. Flowers that are thick in texture, such as citrus, magnolia and gardenia, are often the most distinctive and intense in scent. For the first time in our history high school students who are sitting the CSEC English A and B Examination in May 2018 sitting will be required to complete an English A and B School Based Assessment (SBA) . As such, students are asked to prepare the English A and B School Based Assessment as a project based grade that will be twinned with their English A and B exam marks to produce their final CSEC Exam grade. It is expected that after you fully understand the outline of the SBA. You can then create your SBA groups, selected your group theme and individual topics. It is important to note that your individual topics should not be too broad. The questions is what about air would you want to discuss or review in your SBA? This topic is too broad and so students might select stimuli that are too wide and do not focus on any one particular issue/event/theme. Narrow Topic: How pollution affects the environment? This suggestion does not mean that this is the only way you can phrase your individual topic. However, this is one way of narrowing the topic. When the topic is narrow, your research will be more focused. It will also be easier to find stimuli that are geared towards your topic. The following steps can be done in any order you cho0se. You can either write your plan of investigation or find your three stimuli. For details about the various stimuli click the link (HERE). Some persons choose to find their stimuli first so that they can know whether or not to modify their topics. Individual topics are often modified because it is difficult to find artifacts based on the topic. If you decide to modify your topic please ensure that you consult with your group mates because you don’t want to select a topic that someone else is doing or for there to be any overlap in topics chosen. Also, if you modify your individual topic this change must be reflected in your plan of investigation if your plan was written before. Review how to research (The research I am referring to is finding stimuli that are inline with your individual topic. This can be done via the internet). There is no need to create your own stimuli. This is not required. Additionally, this can be problematic when it comes time to write the reflection. Your plan of investigation must be 100 words. After you have written your plan of investigation, it is important that you compare what you have written to the SBA mark scheme. To my knowledge there is no one set formula or format to writing the plan of investigation. It is only crucial that you include the areas that you are being marked for. Please note that although the plan of investigation is marked out of 10 the final grade will be divided by 2. Do not worry about this step because it does not affect your overall grade. This is just scaling the marks so that the plan of investigation is marked out of 5. There is no 1/2 or .5 grade that is given in CSEC; so if your final grade is 3.5 it will be round up to 4 marks. analyse all three stimuli. You can use the data analysis questions from the Achieve Book 4 SBA guide (HERE) Please note CSEC has modify the Plan of Investigation and other areas that are featured in this document since its publication. Therefore, only note the recommended sections. Know the different aspects of the reflection and the mark scheme. See Reflection Guidelines in the Notes for SBA listed above. It is important to know that the reflection should be a discussion. All artefacts must be integrated in the discussion instead of presented as stand alone pieces. A good writing structure to use is the comparison contrast structure. This can show the similarities and differences between the stimuli as you discuss the different areas of the reflection. You can find a sample reflection (HERE). Please note CSEC has modify the Plan of Investigation and other areas that are featured in this document since its publication. Therefore, only note the recommended sections. The guidelines will be taken from what you did in your 3-5 minutes oral presentation. Your oral presentation grade will be based on your actual oral presentation. Your Oral Presentation Outline is what the CSEC examiners will read to have an idea of what you did for your oral presentation. The oral presentation is your personal response to the SBA. As a personal response you can share your thought, feelings, etc, in a genre of your choice. Remember, that any genre that is chosen you should be the only presenter because it is an individual grade. As an individual piece this is not a group presentation. As a group, you can consult with your group members, help each other to edit the presentation or do mock presentations for each other. Ensure your presentation is an original piece and that it is a reflection of you. Remember that you are being graded for Language Use, so your presentation should mostly be in Standard English. In order to complete the written report you must meet with your group and select at least three stimuli/artefacts from the total number of stimuli/artefacts from members of the group. At least ONE piece of the THREE selected stimuli/artefacts must be in print. The written report should reflect the proccesses and procedures the group took to complete the SBA. Can we have two print? The syllabus did not state you could not. What it stated was that one artefact must be print. Can all three artefacts come from one person? Once again, there is no guideline in the syllabus to address this at this point. However, I would recommend not to do so. Just because it would be a better reflection of the group work process if the stimuli can from different group members. What is there are only three members in my group? In the CSEC Webinar hosted September 2017 it was stated that this type of group would be accepted. It was taken into consideration that there might have been movement of students between the grades 10 and 11 years for various reasons. Do all group members need to have a group of the report? Yes. I would also recommend all group members to also have a copies of the three stimuli selected as well. Do not copy any sample given in a wholesale manner. Remember the bulk of the SBA must be unique in nature. Do not try to cheat the system by copying other people’s work. You might end up shooting yourself in the foot and failing the SBA component of the exam. If you have not done your SBA it would mean that your chances of passing the English A and B exam are minimal at best. The SBA is a process. Do not try to complete it all at once. This would mean that you would not have grown throughout the process and as such, it will be more difficult to write about your experience in the reflection or written report. Group work is here to stay; so, this means that you will have to find a way to work with your group members. Conflicts will always arise; however, teamwork is crucial to the process. It is good to adopt the mentality that if you do not work together you all will fail together. At this point the aim is not to fail; so, find ways to resolve any issues that might arise. This post was written by Sherice Antoinette Blair a teacher, blogger, author and consultant. Readers of this forum/blog/website are given permission to use this information for personal use. Users do not have right to use this information for commercial purposes or training sessions. 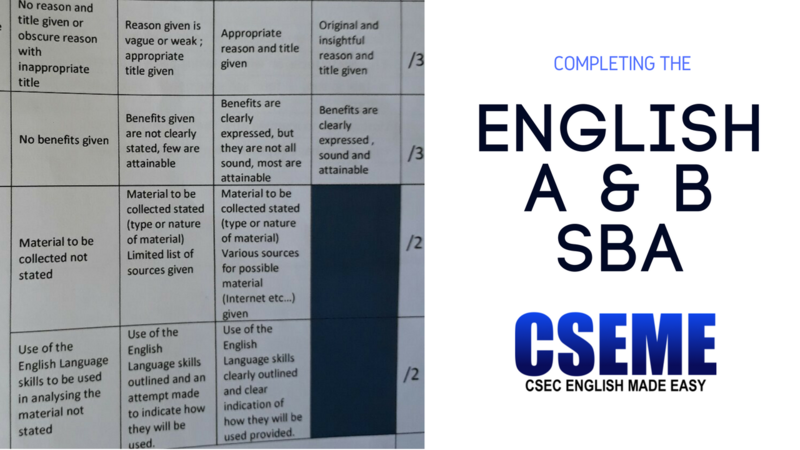 You can seek permission to use this information by emailing: cseme@csecenglishmadeeasy.com. A Job/Application Letter is also a business letter which means the structure of this letter is similar to other Business Letter Format (click the link to review the format). This type of letter can be referred to as a job letter, cover letter or an application letter. All of these names are used to refer to a letter that is attached to your resume’/curriculum vitae when you are applying for a job. The purpose of an application letter is to market your skills and ability to your prospective employer. Therefore, their first impression of you will come from your letter. As such, it is essential that your letter is error free, concise and well structured. With this in mind, we are going to explore the type of information that should be included in the body of the letter. Your body of the letter can be three to for paragraphs. Paragraph 1: State the job you are applying for and where it was advertised and the date. Paragraphs 2-3: State why you would like to work for the company. Highlight what you have to offer the employer , state your experience and skills and say why you are a good fit for the job. For each skill or quality you mention you can also provide a specific example. Paragraph 4: Say thank you to prospective employer for considering you and note how you will follow up. 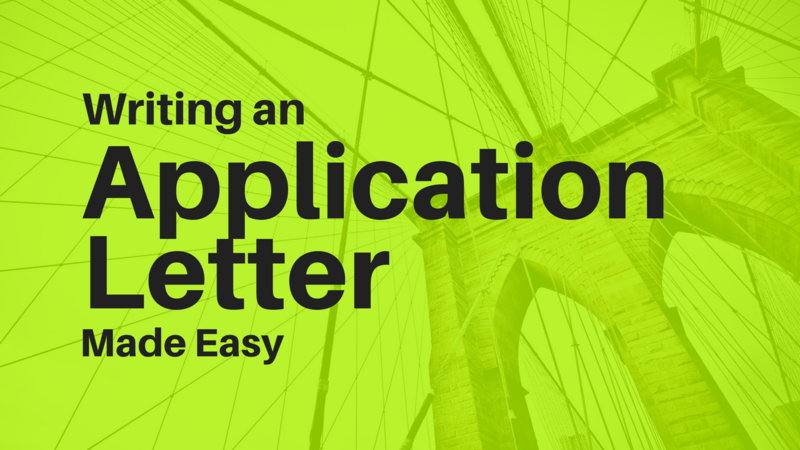 Your application letter is your marketing tool. This means that you are selling your skills, experience and setting yourself a part from the other applicants. Always include key terms/ points/ phrases that your employers are looking for. All employers are looking for employees that are ‘motivated’, ‘team players’, ‘excellent communicators’, ‘driven’, ‘result oriented’, ‘experts’, ‘organized’, ‘pays attention to detail’ and ‘efficient’. These are just a few of the key terms that you can include. 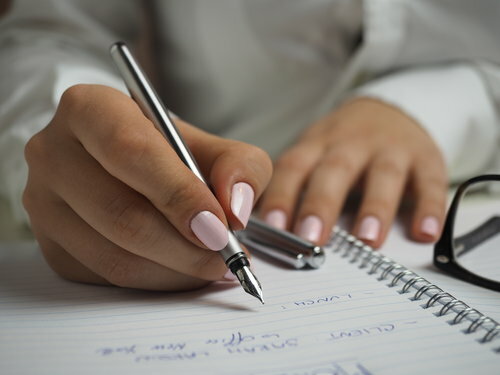 Try and make your letter only one page because an employer is more likely to remember a letter that is concise. Always edit/proofread your application letter multiple times before sending it top a prospective employer. One simple error can cause you not to get the job. You are on a committee planning the celebrations to mark the anniversary of your school. You have heard that some of your classmates plan to boycott the celebrations, and you have been asked to make a speech to persuade them to take part. Write a speech. 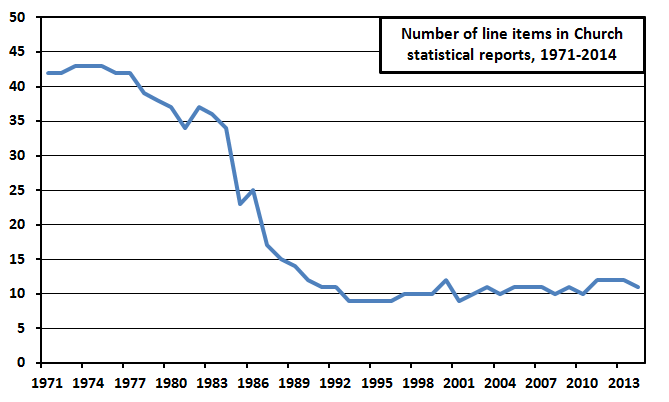 Statistical Report writing has been on the CSEC English A syllabus for a while now. However, it has not been on the CSEC English A exam in quite sometime. In the previous format of the exam paper it would have appear on Section A of the paper in lieu of the Summary. However, on the 2018-2023 English A exam format it is quite possible that it might occur in Section B Expository discourse (see types of expository writing posts). So if you are a student at this point you might be wondering what is Statistical Report Writing. Simply put a Statistical Report is a report that is written based on information that is gathered from analyzing tables, bargraphs, pie charts, surveys, etc. The information gathered is often refered to as trends and significant figures. Watch the video and make note of the definition of the trend. Come back tomorrow for a sample statistical report. CSEC PRO members please see the shop for Lesson Plans and Worksheets.